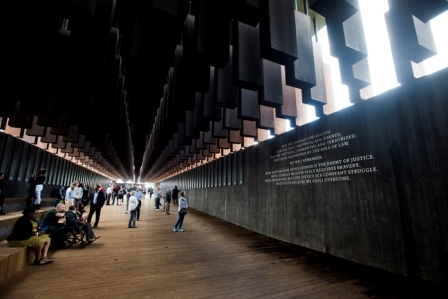 Hundreds of people lined up in the rain to get a first look at a lynching memorial and museum that opened Thursday in Montgomery, Alabama. 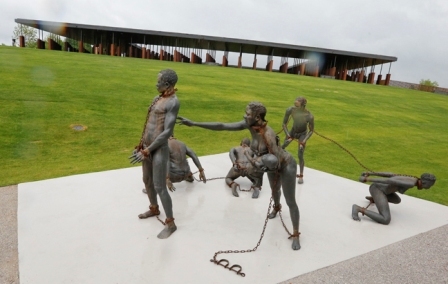 A related museum is also opening in Montgomery, called The Legacy Museum: From Enslave­ment to Mass Incarceration. The crowd included white and black visitors. Mary Ann Braubach, who is white, came from Los Angeles to attend. “As an American, I feel this is a past we have to confront,” she said as she choked back tears. Launch events include a “Peace and Justice Summit” featuring celebrities and activists like Ava DuVernay, Marian Wright Edelman and Gloria Steinem. The summit, museum and memorial are projects of the Equal Justice Initiative, a Montgomery-based legal advocacy group founded by attorney Bryan Stevenson. Stevenson won a MacArthur “genius” award for his human rights work.